Sydney (Press Release): Women young and old, students and businesswomen, from rural areas and multicultural backgrounds, are set to enjoy a diverse range of activities during the first ever NSW Women’s Week in 2019. 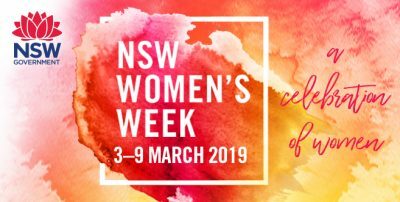 NSW Women’s Week will be held from 3 to 9 March 2019 to coincide with International Women’s Day celebrations on 8 March. For more information, or to find local events and activities, please visit: www.women.nsw.gov.au/nsw-womens-week.